According to a new market research report published by Transparency Market Research , titled ‘Industrial Radiography Equipment Market (Imaging Technique: Film-based Radiography and Digital Radiography, and Application: Aerospace & Defense, Automotive & Transportation, Electronics, Manufacturing, Oil & Gas, and Others) – Global Industry Analysis, Size, Share, Growth, Trends, and Forecast, 2019–2027,’ the global industrial radiography equipment market is expected to reach value of US$ 1,032.7 by 2027. The market is projected to expand at a CAGR of 6.75% from 2019 to 2027. According to the report, the market would continue to be influenced by growing popularity of industrial radiography across the globe. In terms of demand, North America is projected to lead the global market, with the market in the region expanding at a CAGR of 6.70% during the forecast period. Based on imaging technique, the global industrial radiography equipment market has been segmented into film-based radiography and digital radiography. Furthermore, the digital radiography segment has been sub-divided into direct radiography, computed radiography, and computed tomography. The digital radiography segment is expected to expand at a rapid pace during the forecast period, owing to increasing usage of this method for conducting nondestructive testing of components to analyze their quality and ensure their structural integrity. In terms of application, the global industrial radiography equipment market has been classified into aerospace & defense, automotive & transportation, electronics, manufacturing, oil & gas, and others. This can be attributed to increasing use of the industrial radiography method in the manufacturing sector in order to ensure high quality of components. Additionally, industrial radiography is also being used in additive manufacturing by various manufacturers to analyze the quality of additives. Thus, the manufacturing segment is expected to expand at a significant CAGR of 7.98% during the forecast period. North America is expected to hold a major share of the global industrial radiography equipment market during the forecast period. 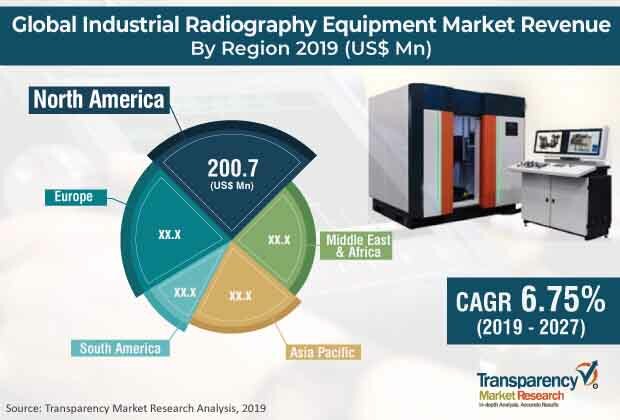 This growth is primarily attributable to the increasing demand for industrial radiography equipment from various sectors in the region such as aerospace & defense, semiconductor, oil & gas, and manufacturing. Industrial radiography equipment are gaining popularity across the Asia Pacific region, especially in developing economies such as China and India. This popularity is attributable to the expanding semiconductor industry and increasing miniaturization of electronic components in the region. Major players operating in the global industrial radiography equipment market are Fujifilm Corporation, Comet Group, Shimadzu Corporation, Nikon Corporation, and North Star Imaging. Details such as financials, business strategies, recent developments, product implementation expertise, key contracts, and other such strategic information pertaining to these players have been duly provided as part of company profiling. The ‘Industrial Radiography Equipment Market (Imaging Technique: Film-based Radiography and Digital Radiography; and Application: Aerospace & Defense, Automotive & Transportation, Electronics, Manufacturing, Oil & Gas, and Others) – Global Industry Analysis, Size, Share, Growth, Trends, and Forecast, 2019–2027,’ report provides analysis of the global industrial radiography equipment market for the period from 2017 to 2027, wherein 2019–2027 is the forecast period and 2018 is considered the base year. Data for 2017 has been included as historical information. The report covers all trends and technologies expected to play a major role in growth of the global industrial radiography equipment market during the forecast period. It highlights drivers, restraints, and opportunities expected to influence the market from 2019 to 2027. The study provides a holistic perspective on the market, in terms of revenue (in US$ Mn), across different regions such as North America, Europe, Asia Pacific, Middle East & Africa, and South America. The report highlights key trends affecting the market at the global level. Furthermore, prominent countries/sub-regions covered in the report include the U.S., Canada, Germany, France, the U.K., India, China, Japan, GCC, South Africa, and Brazil. This report analyzes and forecasts the market for industrial radiography equipment at the global and regional levels. The market has been forecast in terms of revenue (in US$ Mn) from 2019 to 2027. The study includes drivers and restraints of the global market. It also covers the anticipated impact of these drivers and restraints during the forecast period. The report comprises detailed ecosystem analysis, which provides a comprehensive view of the global industrial radiography equipment market. Porter’s five forces model has also been included to help understand the competition landscape of the market. The study encompasses market attractiveness analysis, wherein imaging technique and application segments have been benchmarked based on their market size, growth rate, and general attractiveness. This research study of the global industrial radiography equipment market provides detailed analysis based on imaging technique and application segments of the market. Based on imaging technique, the market has been segmented into film-based radiography and digital radiography. The digital radiography segment has been sub-divided into direct radiography, computed radiography, and computed tomography. In terms of application, the market has been classified into aerospace & defense, automotive & transportation, electronics, manufacturing, oil & gas, and others. The digital radiography segment is expected to expand at a rapid pace throughout the forecast period, owing to high accuracy and better image quality of components under consideration offered by this method. In terms of revenue, the aerospace & defense segment held a major market share in 2018, as structural integrity and high quality of components is of key importance in the aerospace & defense sector. Secondary research sources that are typically referred to include, but are not limited to: company websites, annual reports, financial reports, broker reports, investor presentations, SEC filings, internal and external proprietary databases, relevant patent and regulatory databases, national government documents, statistical databases, market reports, news articles, press releases, webcasts specific to companies operating in the market, national government documents, statistical databases, and Factiva. Primary research involves e-mail interactions, telephonic interviews, and face-to-face interviews conducted for each market segment and sub-segment of the market across different geographies. TMR conducts primary interviews on an ongoing basis with market participants and commentators in order to validate the data and analysis. Primary interviews provide firsthand information on the market size, market trends, growth trends, competition landscape, and market outlook. These help validate and strengthen secondary research findings. They also help develop the analysis team’s expertise and market understanding. The report covers well-established players operating in the global industrial radiography equipment market including Fujifilm Corporation, Comet Group, Shimadzu Corporation, Nikon Corporation, and North Star Imaging. These established players are engaged in the development of innovative industrial radiography equipment and their introduction in the market. For example, in November 2018, Fujifilm Corporation announced that it would be adding two new digital radiography (DR) detectors i.e. the Calneo Dual (available only in Japan) and the FDR ES to its portfolio of digital radiography solutions.